This the seventh in my series of monthly projects that I hope will get you excited about In the Kitchen With Laura. I’m finally caught up again and here is my post for July. 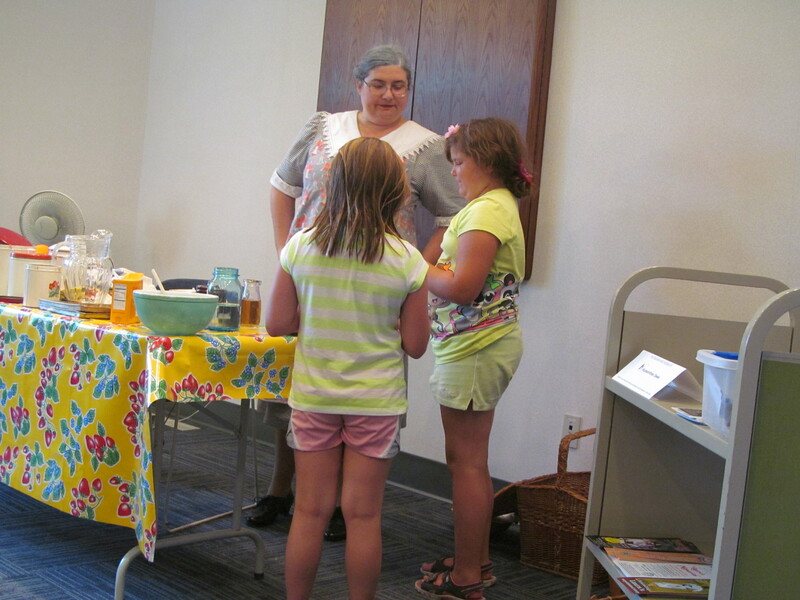 In the Kitchen With Laura has continued to be a popular program this year. The photo above was taken during one of my programs. During the program we learn about Laura’s life and have the opportunity for hands on projects like making Ginger Water. Ginger Water from Sarah Uthoff on Vimeo. Add brown sugar and ginger to a pitcher and mix. Pour in cider vinegar mixing until they dissolve. Add cold water and stir. Add the baking soda right before serving, stirring well. After initial bubbling ends, you may add more baking soda to start it again. It may be kept overnight either on the counter covered or in a refrigerator. The continued chemical reaction will change the taste, but it will continue to work. It’s most effective though when freshly mixed. After the second day throw away any that is left and start over. If you’ve never tried ginger water before start with a very small taste. People are very divided over whether they like it or not. I’ve given out maybe a 1000 tastes over the years and people are normally evenly divided between swallowing it down, but hating it and those who ask for more. At the extremes, you get a few spitter outters and a few recipe ask forers about every time you make a batch. A drink of a very similar make up and purpose, but with a much more exotic name is Switchel. It was recently highlighted on a PBS cooking show. Sarah S. Uthoff is the main force behind Trundlebed Tales fighting to bring the History, Mystery, Magic and Imagination of Laura Ingalls Wilder and other greats of children’s literature and history to life for a new generation.Attend one of her programs, schedule one yourself, watch her videos, listen to her podcast, and find her on Facebook, Twitter, Google+, LinkedIn, and Academia.edu. She is currently acting President of the Laura Ingalls Wilder Legacy and Research Association. Professionally she is a reference librarian at Kirkwood Community College and director of the Oxford (Iowa) Public Library. I’ve never heard of ginger water outside of Laura’s world, so the baking soda is a new twist. Walker’s Cookbook doesn’t use it, I think (traveling and don’t have the book with me, but I made it once upon a time, of course, and don’t recall that ingredient). Do you think Laura’s version would have included the soda, or do you add it because more people are familiar with the modern version of ginger ale? Love the In the Kitchen with Laura series. The baking soda is in Barbara Walker’s version, it’s just buried in the fine print and while it probably wouldn’t be using modern baking soda in the 1880s, they would have used some sort of base to interact with the acid because that’s part of how it works to not upset your stomach. Glad you are enjoying the series. Next Next post: Handwriting Useless?